This Beatitude always causes me to pause and be amazed at its promise. Those who have a pure heart will see God. Of all the Beatitudes, none of them cause my heart to stir like this one. From our earliest years of learning about God, to our numerous years in the Christian faith, nothing has been more mysterious or exciting as the thought of seeing God. There are so many stories of seeing God, such as Moses being hidden in the cleft of the rock and being allowed to see the train of God’s robe, and of Isaiah standing in the temple of the Lord, and the disciples at the Transfiguration, and last, but not least, the book of Revelation. All of these stories stir up this desire to see God. What is so beautiful about Matthew 5:8 is the entire Gospel message. Only the pure in heart will see God, but who among us has a pure heart? Only the pure in heart will be blessed to see God. Who are the ones who are pure in heart? Thanks to Jesus Christ, all who believe in Him have hearts that are made pure. Thanks to Jesus, if you have faith in Him, you will be blessed to see God. Prayer: Heavenly Father, we love you. Thank you so much for salvation. Our hearts were stained with sin, but you sent Jesus your Son to make us clean. Thanks to His work on the cross, we are blessed to know you, to be known by you, and to one day be able to see you. Thank you so much Father! We love you. Amen. The parable of the unmerciful servant is a challenging one. It is not challenging in that it is difficult to determine the meaning, but difficult to face. When we read the parable, we like to identify as the man with the lesser debt who is mistreated, and we often do not put ourselves in the place of the man who lacks mercy. But that is precisely why this parable is so important! All of us have suffered harm because of others. They may have said or done something that hurt our feelings, or they may have attacked our character with gossip and lies. Whatever it may be, these people are hard to forgive and show mercy to. If we are not careful, we can quickly find ourselves in the same place as the unmerciful servant. In the parable, the first servant is forgiven a debt he could not possibly have repaid, even if he had lived 1,000 years. It was a large debt that shows he had not made wise decisions and put himself in a position where there was no way out. Had the king not shown him mercy, this man’s life would have been doomed to imprisonment and death. But when mercy is given, he is set free to have life again. However, this man did not learn from the king, because with his new found freedom, he lacks mercy for others. The message is clear: God, the King of kings, forgave us the debt of our sins through sending His Son. We could never have paid off this debt without God’s mercy. But thanks be to God that we have been set free and given a new life! We must learn from the King’s mercy, and imitate Him by showing mercy to others. We must recognize the great weight of mercy God has shown us, and let that transform your heart. Knowing we have been forgiven such a heavy price, how can we now not also show mercy to others, who have done far less than we have? Application: When God goes about working in us and making us into His perfect, holy image, He teaches how to live like Christ. Indeed, you could say God is making us all into little-Christs in this world. 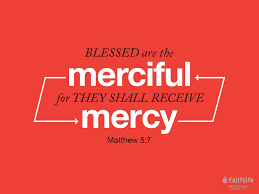 That being so, we should show mercy to others. Our sins cost God’s Son His life upon the cross. It will not cost us nearly as much to forgive offenses others have done to us. Let the mercy of God take root in you, and let it set you free to forgive. When we learn the power of mercy, then we will be set free to live this new life God has blessed us with in Christ. Prayer: Heavenly Father, thank you so much for your unmatched mercy. You have set us free and given us a new life filled with hope and peace. May we learn from you and grow in mercy. Teach us and help us to be merciful just as you are merciful. May we live mercy to others for the glory of your name and for the growth of your kingdom. We love you, our Father and our King. Amen. Jesus’ parable of the talents is a familiar and popular one. Three servants receive different numbers of talents to put to work, and two of them work diligently to double their number of talents, whereas the third servant feared losing his master’s talent and hid it away. As I was reading through this parable recently, God gave me pause, and told me to rethink this parable. I have come to know the story so well, that I do not listen for Jesus teaching through it anymore. I assume I have the complete answer, and then I move on reading. I believe God would rather us pause and sit to learn from Him rather than assume we have mastered portions of His Word. God still has so much He wants to teach us, but we must be willing to humble ourselves to listen and learn. When I reread the parable (a few times), I began to think about the efforts of those two servants who doubled their talents. They were willing to risk what their master had given them by putting the talents to work. We do not know what work they did, but it must have been something they put themselves fully into in order to double their original amount. They were dedicated and diligent workers for their lord, and they were greatly rewarded for it. The first two servants can be described as courageous, devoted, and hard-working. The third servant, however, could be described as fearful, lazy, unambitious and unloving. He feared his master more than he loved him, which is seen in the words he speaks to his master. We are left to think about these three servants and determine what kind of servants we want to be for our Lord. Whether He gives one, two or five “talents” to work with, our response and devotion will determine the work of our lives. Application: As I began to think about them, my heart began to burn with the desire to be one of the servants who worked diligently and doubled the talents. In order to do that for my Lord, Jesus Christ, I would have to be willing to throw myself fully into the work He has called me to. I would have to be dedicated and diligent to “double” what He has entrusted to me. The most important thing I took away, though, was that this would be hard work, but it would be worth it. Those who desire righteousness will seek to honor Christ with their life. 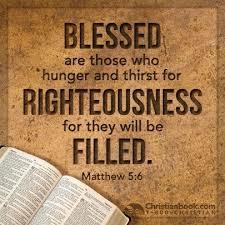 Blessed are those who hunger and thirst for righteousness, for Christ Himself will fill them up. Prayer: Heavenly Father, thank you for causing us to pause and learn from you. Please do not let us come to the place where we feel as though we have nothing else to learn from you. Give us a desire to honor and glorify you with our lives. Thank you for filling us with your Spirit. We love you, Father. Amen. The opening chapters of 1 Samuel tells us of a woman named Hannah. She is one of the wives of Elkanah, and she seems to be his favorite of the two women. Elkanah has children through his other wife, but Hannah remains barren and childless. The other woman taunts and teases Hannah until she is angry and bitter with tears. The Bible is relatively silent on Hannah’s attitude during this, but she seems to be very meek. We don’t read of her making a fuss or stirring up trouble. She appears to be teased to tears, and then shuts down from others so she can weep. Her heart is heavy with sadness, yet she doesn’t appear to fight back. Hannah could have returned fire by boasting in being the favorite wife of Elkanah, but she doesn’t. As we read the story, the only place Hannah is able to find peace is when she has poured out her heart to the Lord. Her prayer is not heavy with words, but actually empty of words. She prays from her heart and through her tears. As we read, we find our hearts warmed and joyful when we read verses 19-20, “And Elkanah knew Hannah his wife, and the Lord remembered her. And in due time Hannah conceived and bore a son…” God remembered Hannah pouring out her heart to Him, and at the right time, God blessed her with a son. This child, Samuel, will grow up to play a significant role in Israel’s history, and rightly so! He is born to a woman who appears to have been meek and devoted. She humbled herself before the Lord, confessed her weakness and bitterness to Him, and she was blessed by God because of it. In her weakness, God was strong. In her meekness, God blessed her greatly. Application: Meekness is often associated with weakness. This is not the case! It is much more accurate to match meekness with humility. Meekness is not trusting in your own strength and knowledge, but in trusting the Lord to fight for you. We are all very defensive of areas we are weak in. We may overcompensate to distract from our weakness, or we may point out obvious weak areas in others. Meekness means handing your weakness over to God and trusting Him to be strong for you. After God answered her prayer, Hannah prayed this in 1 Samuel 2:9, “He will guard the feet of his faithful ones, but the wicked shall be cut off in darkness, for not by might shall a man prevail.” It will not be the strength, knowledge and creativity of man the grants success, but the presence and work of God. Do not be afraid to be meek before the Lord. In your meekness, He is strong. Prayer: Heavenly Father, teach me the beauty and strength of meekness. There is more to be had through trusting in you than in myself. Teach me to be meek so that your may be glorified through my life. May I never be ashamed to trust you in the pieces of my life I am lacking. I love you, Father. Amen. John 11 is a wonderful chapter to describe the power of our Lord. He is able to turn tears of mourning into warmth and comfort. In John 11, Jesus receives news that a friend whom He loves, Lazarus, has fallen ill. Jesus waits two days before going to visit Mary and Martha, who were the sisters of Lazarus. Jesus knows that the illness has killed Lazarus already, but He goes in order to bring comfort as only God can. When He arrives, Jesus is met by Martha in the streets outside her home. She knows that Jesus could have saved her brother from sickness and death, but she still has faith that Jesus will raise Lazarus to life, if only at the resurrection on the last days. Her faith in the salvation and resurrection God has promised gives her some comfort, but Jesus offers her full comfort in His response. John 11:25-26 reads, “Jesus said to her, ‘I am the resurrection and the life. Whoever believes in me, though he die, yet shall he live, and everyone who lives and believes in me shall never die. 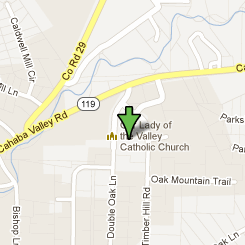 Do you believe this?” Martha believes Jesus, and follows Him as He leads hr and Mary, her sister, to the tomb of Lazarus. It is here that Jesus brings Lazarus back to life, even though he had been dead four days already. Martha, Mary and Lazarus are reunited, and their outlook on life and eternity is forever changed. Their hope for the resurrection has gone to a depth that they had never known before, and now they had hope and comfort in the face of inevitable death on earth. Jesus had turned their mourning into dancing, and their sad tears were now tears of joy. Those sisters who were mourning were now blessed and comforted. Jesus Christ is able to give perfect comfort to all people who seek Him during their mourning. Application: All of us reading this knows what it is like to lose someone you love. Maybe you have lost a parent, a grandparent, a child, or a close friend. We have heard of death’s that made us sad, and some have almost crippled us with mourning and shock. Death is something we all fear, and when we are confronted by it, we are not sure what we need to move on. I believe we learn from John 11 that we all need comfort, and that perfect comfort can only be found in Jesus. He is life, resurrection and eternal life. He has defeated death and conquered sin. If you are mourning anything in this life, and there is much to mourn other than death, then I urge you to look to Jesus. He is able to give perfect, complete comfort to all who seek Him. I pray He gives comfort to you at every hour of need. Prayer: Heavenly Father, you know what it is to feel mourning and sadness. We read in John 11 that even Jesus wept over the death of His friend. In our mourning, we seek you and ask for your comfort. May your perfect comfort carry us through every season of mourning we face, and may your peace always be with us. We love you, Father. Amen. When reading through the Beatitudes, some of the teachings of Jesus tend to jump out. Write at the start, the very first Beatitude seems unusual and, to be honest, undesirable. Who wants to be poor in any sense of the word? Especially when it relates to your own spirit, being poor is something that does not seem enjoyable. 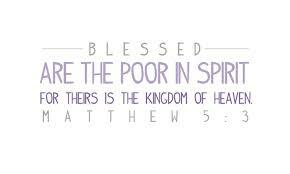 Yet Jesus says that those who are poor in spirit will be blessed to dwell in the kingdom of heaven. Many of us are familiar with the story of the prophet Elijah. He appears to the wicked King Ahab and foretells of a three and a half year drought, and then he flees to live in the wilderness. 1 Kings 17 details all of these beginning stories of Elijah’s adventure, but Elijah is not the focus of this blog post. Instead, I want us to look at the Widow of Zarephath. This woman is left to care for her son, and life has not been easy. She is a single mother, which at this time in history made life very difficult, if not impossible without help. She has nobody and nothing when we meet her, expect for just enough oil and flour to make a small cake. After this meal, the widow plans for her and her son to starve to death. It is in the midst of this anxious and horrifying time that Elijah wanders into her life, and asks her for all she has left, the small cake. This widow, who is poor in body and in spirit, does as Elijah asks, and shares the small cake with him. Her generosity is startling, to me anyways. Even though she was poor in spirit, evidenced by accepting her fate to death, she still was willing to show kindness to a stranger and foreigner. God blesses this widow and her son greatly as a result of her kindness. We do not know how the widow’s life goes once Elijah leaves her home, but for this time, we see one who is poor in spirit be greatly blessed by God. Application: Elijah is undoubtedly the main character of this story, but this widow has much to teach us as well. None of us desires to be in such a desperate and dark place in life as she was, but most circumstances are out of our control. However hard life may become or how dark a situation may be, we can control how we respond during it. This widow, though poor in spirit, chose love and kindness. May we too choose love when hate is easier. As we spend more time as children of God, we should be growing and developing the mind of Christ. The mind of Christ chooses love and kindness when the spirit is feeling low and poor. May God’s Spirit work in us and through us to walk in God’s blessings, even when we are feeling poor in our own spirits. Prayer: Heavenly Father, help us all to have the mind of Christ. Teach us to be lights for your glory whether our spirits are poor or wealthy. Lead us in your ways. We love you, Father. Amen. “You are the man!” These are the chilling words Nathan proclaims to King David. David had done what we all would have said was unthinkable. He had committed adultery with another man’s wife, and when he discovered the woman was pregnant, David had the man killed in battle. Uriah was the man’s name, and he was a devoted soldier in Israel’s army. David’s sins take us by surprise, but 2 Samuel 12 confronts us with a tension we didn’t expect. It is hard to imagine someone holding an authority figure accountable, but that is what Nathan the prophet does with David. Nathan tells a story to hear David’s reaction to a crime that was committed, and then Nathan reveals the true story: David is the criminal. Upon hearing the charges, David humbles himself before the Lord and Nathan and repents. The actions are not erased, but they are also not ignored. King David had fallen short of the righteous standard of God, and the results of his crimes are many. But Nathan had the courage to go before David to confront him with his sins, and David responded with humility. Application: It is scary to consider holding others accountable. What if they respond with anger or attempt to accuse us of our own failures? Who am I to hold them accountable since I have made mistakes too? We must not have this attitude when it comes to accountability. At the heart of accountability is love for others. In Galatians 6:1, Paul instructs us to restore others who have fallen into sin. Paul also tells us to restore them using a spirit of gentleness. Accountability is not about anger and shouting, but about love and commitment to God. Nathan loved David enough to hold him accountable, and Nathan revered God enough to uphold His righteous instructions. Do you love others enough to restore them from their failures? Are you able to be gentle, yet bold, in confronting someone who has done wrong? These questions make us feel uneasy, but is important that you think on the answer now and not when your response is needed. Keep a high view of God’s call to holiness and righteous living, and remain gentle and humble when holding others accountable. We all fall short and make mistakes, so we should be understanding with one another. But God has called us to stand apart from sinfulness and live holy lives, so be bold to not excuse sin either. With the help of God’s Spirit, we will be able to bear the burdens of others with a spirit of gentleness and a zeal for righteousness. Prayer: Heavenly Father, thank you for saving me from my sins and giving me a desire to live a life worthy of your great salvation. Help me to be humble and understanding with the mistakes of my fellow Christians, and also be strong and loving enough to hold them accountable. May we work together to be a righteous people that is pleasing and honoring to you, God. I love you, Father. Amen. I love the Old Testament. I love Genesis. I love the stories of the men and women whom God used to begin His work in this world. In Genesis 35, we see the return of Jacob to Bethel, and this is a huge moment in Jacob’s story. Back in Genesis 28, Jacob has a vision of a ladder reaching up into heaven, and God stands at the top of the ladder and speaks to Jacob. It is a passing of the torch, if you will, to Jacob from Isaac and Abraham. Jacob receives the covenant promises from God, but Jacob responds rather arrogantly. If God goes with Jacob, blesses him greatly, and then brings Jacob back to his homeland, then Jacob will call the Lord his God. In Genesis 35, Jacob returns to the place of that vision, Bethel, and God has done all that Jacob challenged Him to do. That is what makes Genesis 35 so powerful. Did you notice the strangeness of God’s words in verse 1? “Arise, go up to Bethel and dwell there. Make an altar there to the God who appeared to you when you fled from your brother Esau.” It is fitting because Jacob allowed his wives to bring the idols of their father, Laban, with them on the return to Jacob’s home country. Who is the God that blessed Jacob and brought him back? Who will the altar be dedicated to? Jacob instructs his wives to gather all of their idols and anything that was devoted to them, such as jewelry, and Jacob buries all of it beneath a terebinth tree in Shechem. We learn two things from this. First, Jacob would know and remember where the idols were buried. It was not a random spot because someone may come along one day to dig and accidentally discover them. He buried them under a marker, the terebinth tree, so that throughout history his family would know where the idols were so they could avoid stumbling upon them. Secondly, after the burial, Jacob leads his family away to follow God. Application: This story is a powerful lesson to all Christians. When we first come to God as His children, we brought our former ways of life with us. We had to unlearn some sinful ways, or to parallel the story, we had to decide to bury our idols. This should not be done flippantly, but we should know where they are buried so that we are sure not to return to them. Once they are buried, we must turn our backs to them and travel along the narrow path of following Christ. Who is the God who rescued you from sin and death? Who is the God who has shown you love, mercy and grace, and filled your life with hope and peace? Honor the one, true God, Jesus Christ, with your life, and bury your sins and idols deep beneath the terebinth tree. Leave them all behind, and follow Jesus. Prayer: Heavenly Father, we praise you and thank you for saving us from our sins. If we were not careful to know where we buried our sins, help us to bury them in the place where they are marked and easily avoided, and help us to live for you alone. May we never return to the burial place, but go into all the places you alone lead us. We love you, Father. Amen. We are approaching a new year in the coming days, and we all need to be asking, “Will it be a better year?” 2018 has ups and downs for us all, and we all enter a new year hoping that life will get better in every way possible. Every year, I like to take time to reflect on my relationship with God and reflect on our year together. Have you ever done this? Have you taken time to remember all of the blessings of God? Do you remember the prayers He answered? Have you grown closer to God? We are blessed to know God every day on this earth, and each one should be used to the fullest. As I was reflecting and thinking about my resolutions for 2019, I was led to psalm 27. As I read through it, I found that my mind was comforted and my heart was filled. The psalm begins saying, “The LORD is my light and my salvation; whom shall I fear? The LORD is the stronghold of my life; of whom shall I be afraid?” None of us knows what all we will experience in 2019. We will face challenges and trials, and we will have times of victory and celebration. And through every day of 2019, God will be with us. His light and His presence will go with us into all the places we go, and He will never leave us. Knowing that, will 2019 be a new, better year for you? Will you take on this year with more confidence and strength? Will you have peace in God’s constant presence? I hope and pray that we all would. We all would love to find our daily strength and peace in God, and so we seek Him and pray for His help. God is faithful to mature us and teach us His ways, and He does not ask much of us. God does not demand perfection, nor does He ask for money or gifts. Psalm 27:8 says, “You have said, ‘Seek my face.’ My heart says to you, ‘Your face, Lord, do I seek.’” God is asking you to seek His face. How will you respond? If you will seek His face, you will find our Heavenly Father smiling on you and leading you in His ways. Praise God for His amazing love and constant grace! Application: With 2019 quickly approaching, I want to challenge you to make it a year where you seek God’s face like never before. If you are a young believer, that may look like committing to read 3-5 chapters of Scripture a week and praying more than last year. For a more mature believer, it may look like reading 3-5 chapters of the Bible each day and praying throughout the day. Wherever you find yourself on your spiritual journey, I want to challenge you to seek God’s face more than you ever have before. Do not become consumed with reading the Bible and prayer, but become consumed with Christ! Let your love for Him grow and urge you to seek Him more and more. With God’s Spirit at work within us, 2019 will be the year we learn to seek His face like never before! Prayer: Heavenly Father, you have asked us to seek your face, and we desire to do just that this year. Please teach us and lead us in your ways, and make us into a church that shines like a bright light into our community. May we each glorify you, and cause your face to smile on us. We love you, Father. Amen. One of the most popular Christian songs of 2018 has been “Reckless Love.” We sing and worship our God who came to save us because of the amazing love He had for us. It is an amazing song to focus us on how great God’s love is for His creation. However, one critique of the song has been that God’s love is many things, but it is not reckless. I do not say this to ruin the song! I truly enjoy it and the way it makes me reflect on God’s love. I also think we can all be encouraged this Christmas season that God’s love is faithful and certain. We read in the opening chapters of John’s gospel that the true light, Jesus Christ, was coming into the world. Why is the Light coming? Because God so loved the world that He sent the Light, His only Son, to give eternal life to all who would believe in Him. Some people will not believe, and their sin and unbelief will condemn them. But to those who do believe by faith in Jesus, they have been given the right to become the children of God. God’s love is deep and lasting; it does not falter or fail. It is strong enough to save souls from the grips of sin and death. God’s love is healing for broken hearts, warmth for the lonely, and assurance for the fearful. This love is read throughout Scripture, but nowhere is it on better display then in life and words of Jesus Christ, God’s only Son. Application: With Christmas drawing near, there is no better time to reflect on the amazing love of God. Jesus Christ left His heavenly home to come down to the world that He made. This world needed a Savior, and God’s love delivered His only Son to bring it. This is Christmas. I hope that we all take time to remember the God’s love being put on display. It did not come in the form of a conquering king, but in the form of an infant, wrapped in swaddling cloths and lying in a manger. May God’s love ring loud and true in our hearts and in the world this Christmas season. Prayer: Heavenly Father, thank you for your amazing love. It is hard for us to comprehend the fullness of it, but we are eternally grateful. Help us to reflect, know and feel more of your great love every day, and may we be faithful to share your love with the world. We love you, Father. Amen.